Do you ever get programs on your computer trying to update? Sometimes its hard to know whether to accept or decline when these pop up requests show up. I’ve decided to release a series of articles on some of the more common updates and what you should do when you see them. In this article I will focus on the ever persistent Java Update. For those looking for a simple answer as to whether or not to update Java the answer is Yes. To help you understand why it is critical you need to know what Java is and what it does. Java is a programming language used by developers to make applications and is most commonly used on websites for special uses, videos, and games. Without Java installed you will be unable to properly view websites that have been made using Java. There are 3 primary reasons that java is frequently updated. Why does this thing keep popping up! The vast majority of Java updates are meant to patch security vulnerabilities. Viruses are often written using Java and are hidden on websites and may exploit or infect any computer with Java that visits the website. Oracle, the owner of Java, releases security patches whenever these exploits are found. 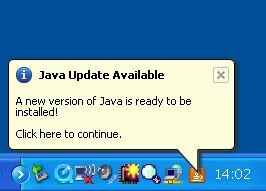 This means that the vast majority of viruses and trojans written in Java will only work on computers that are using an outdated version of Java. Windows 8 is the biggest change to Microsoft’s iconic operating system since it added the start bar to Windows 95. This change has been met with praise and loathing alike. I can explain both responses by saying that Windows 8 is built for the future more than the present. Windows has a problem. The computing landscape is changing as smartphones and tablets are growing in both popularity and usefulness for tasks formerly only achievable with a traditional PC. The need for PCs is decreasing and with it the need for the most popular PC operating system, Windows. In face of this dilemma Microsoft had two options; deny the problem exists or change its business model and products. Microsoft wisely chose the latter, but with change inevitably comes resistance, new unforeseen problems, and at least a few mistakes. So what exactly is Microsoft trying to do with Windows 8? The answer is that Microsoft is trying to create a product that gives users a continuity of experience on its phones, tablets, and PCs. In comparison, Apple gives its iPhone and iPad users a nearly identical experience while its Mac computers are very different. So the reason Windows 8 is built more for the future than the present is because it has been built to look and feel the same on a multitude of devices rather than improve the experience on a desktop with a mouse and keyboard. With this review I hope to answer the following questions; does Windows 8 give users a uniform and enjoyable experience across devices, what is new, and should you get or avoid Windows 8? As many commentators have noted the change from Windows 7 to 8 can be a jarring experience. No longer are users greeted by the familiar taskbar, start button, and a desktop riddled with static icons. Now when a user starts up their computer it is to a continuous page of what Microsoft calls “live tiles”. These live tiles are essentially shortcuts to apps and programs except they have the ability to display continually updated information. For example, the Windows Mail app Live Tile will display the number of new emails waiting to be read and a news app might display a rotating set of news snippets. I personally enjoy the live tiles and the ability to have basic information from my apps displayed at a glance. I should also note that every live tile can optionally be shut off to not show any information. 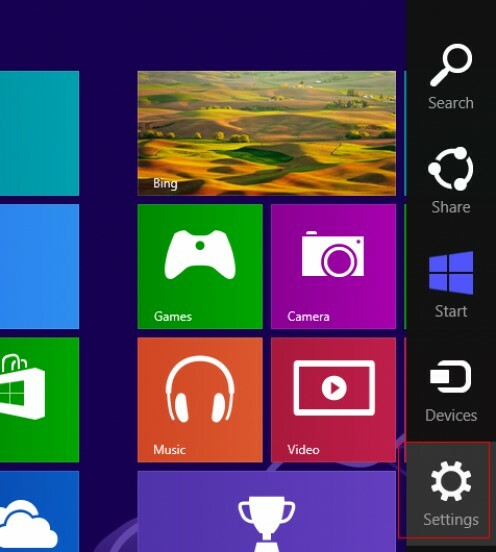 There is also a live tile called “Desktop” that users can click to bring up a desktop that is very similar to Windows 7 except that there is no start button on the bottom left corner. Instead, users can click in the bottom left corner which brings them back to the live tile filled start screen. The transition from “start bar” to the “start screen” may be a little confusing at first but overall it gives users a slightly greater level of functionality. The biggest advantage of live tiles of course is on a touch enabled device where it is very difficult to use the standard start bar with its icons that are smaller than the average person’s fingertip. 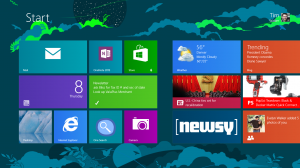 Of the changes made to Windows 8 the start screen will be easier to adjust to. Older applications made for previous versions of Windows will continue to operate as normal on the desktop. The confusion sets in when using an app specifically designed for the Windows 8 metro environment. The difference is that these apps are designed to run in one of three sizes; full screen, 2/3 screen, or 1/3 screen. The 1/3 and 2/3 modes allow users to run two apps simultaneously with one taking up the majority of the screen real-estate and the other a small 1/3. On a desktop this is a strange limitation as most desktop programs are designed to be resized and moved wherever and however the user wants. In the tablet world, however, this is a major improvement as apps made for the iPad or android are exclusively full screen. This gives Windows 8 tablets a multi-tasking ability that is not found on its competitors. Although the change would seem strange if Windows 8 was only for desktops it has the advantage of allowing developers to make apps that are equally at home on a desktop or tablet. The most difficult adjustment to be made in Windows 8 will be learning how to use the gestures and “charms” for its new metro apps. The first shock that I ran into using a Windows 8 without any prior instructions was that I didn’t know how to close apps. Typically I would click the little X on the top right of a program to close it but since metro apps always run in full screen no such button exists. In fairness to Microsoft, Windows 8 includes a tutorial that I skipped because I didn’t think I needed it. It turns out closing apps is a simple gesture of grabbing from the top of the screen (with mouse or finger) and dragging down to the bottom. It is one of several new gestures that have already become second nature but initially seemed very odd. The “Charms” that Microsoft has added are a set of five icons that can be accessed from any app. The charms are accessed by either swiping left from the far right of the screen or by moving the mouse to the bottom right or top right corner. The five icons in the charm bar are Search, Share, Start, Devices, and Settings. According to Microsoft these five options should provide users with easy access to the most common tasks the same way throughout all apps rather than using in app methods that would differ in every app. The benefit is that users will not have to learn how to access these options in each new app downloaded as it will be common among all Windows 8 apps. Any additional app options can be accessed by swiping up from the bottom of the screen or right clicking near the bottom. Some of the best upgrades to Windows 8 are “under the hood” and won’t necessarily require users to learn anything new. In general Windows 8 performs better than windows 7 since it is designed to run on compact and often less powerful systems. That means that most computers still running Windows XP and Vista can be upgraded and may even run quicker with Windows 8. This is especially good news since Microsoft will be ending support for XP in 2014. Users will also notice that Windows 8 boots up much quicker than previous iterations. On a security side Microsoft has greatly improved things by adding features such as secure boot, bundled anti-virus, and the very nature of its new apps is also deceases vulnerability. Other optional features that users can take advantage of include Microsoft accounts (formerly live profiles), built in synchronization, and Windows to go. All of these new features center on the ability to take your own personal settings and files with you on multiple computers ad devices. The Microsoft account allows users to have a single login id for all Windows 8 devices and phones and synchronizes settings between them. This is especially useful when switching between devices so you do not have to set each up each individually. Your Microsoft account also gives you access to a SkyDrive account that can store your files in the cloud and locally on each device. This allows uses to work on a single document from multiple devices without the need for a thumb drive or emailing it. Windows to go, on the other hand, is a somewhat different way to transport files and settings. Windows to go allows users to install a mobile version of their computer onto a thumb drive. Take the thumb drive with you and plug it into another Windows 8 computer and you can run the computer entirely off your own thumb drive without any cross contamination. Unplug the thumb drive and and none of your own files or settings are left behind. This feature is not only useful for people that are constantly borrowing computers, it also has major advantages for businesses. The trend of employees bringing their own devices to work has created a security issue for many businesses. Businesses are unable to enforce the same stringent policy restrictions on employees PCs as those owned by the company thus leaving sensitive company files and documents vulnerable. With Windows to go businesses can supply their employees with a company thumb drive running Windows 8 with full encryption and policy restrictions in place. The employee runs his/her computer off the company thumb drive while working and can simply remove the thumb drive to have full access to access the internet, download apps, or any other questionable activity without endangering the company data. For users considering buying new tablet or computer there are a few things to consider when thinking about Windows 8. On the negative side there is a learning curve to using the interface and for desktops it doesn’t necessarily improve the experience. Also, Windows 8 is still very new and untested so there is a very real possibility of running into bugs. The biggest advantages for the OS that it offers a great experience on touch enabled devices and effortless synchronization between a user’s multiple PCs, Windows 8 tablets, and Windows phone. There are also improvements in performance and security. Who should consider upgrading to Windows 8? If you are looking for a new computer you will probably be getting a Windows 8 PC. It is worthwhile to look for a computer with a touch enabled screen if you are going to be using Windows 8. Considering getting a second computer? It may be useful to upgrade your old computer to Windows 8 also to benefit from the synchronization between computers. Need a tablet sized computer for work? Consider a Windows 8 tablet but make sure you understand the difference between Windows 8 pro and Windows 8 RT. Once you’ve used Windows 8 on a tablet it will be easy to transition to a desktop. You want the latest and greatest before your friends get it. 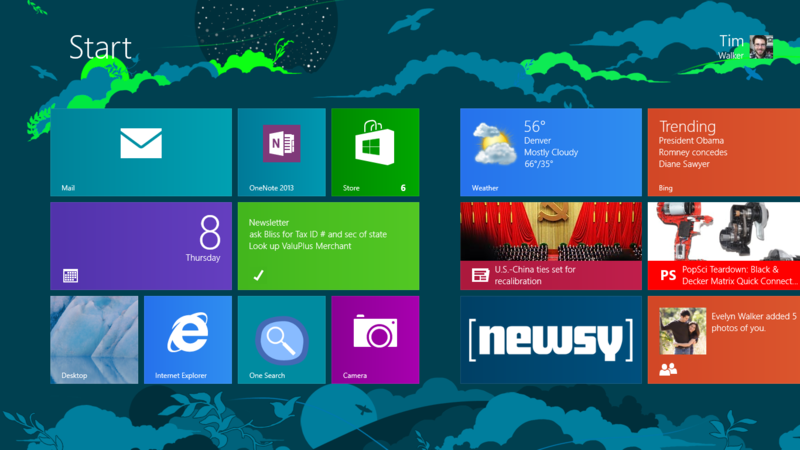 I will also be writing a review for the new Windows Surface and Windows 8 RT for the next newsletter. If you have additional questions about Windows 8 please feel free to contact me. On June 6th, Apple released the newest version of its MacBook Pro series; the new MacBook Pro 15″ with Retina display is a new vision from Apple. In essence, Apple tore apart old ways of thinking, and in their own words, “had to start again, and with great intent disconnected from the past.” With the willingness to change things, Apple has opened up the possibilities to a whole new design. The new MacBook combines computing power with high portability. The new machine features a retina display with over 5 million pixels in a 15.4″ display; that’s a million more than in a standard HDTV display! The pixel density is so high that your eyes can’t discern individual pixels. And with a 2880-by-1800 resolution, you can see more of your high-resolution images onscreen with pixel-for-pixel accuracy. The new Retina display reduces glare while maintaining amazing color and quality. In fact, it has a 29% higher contrast ratio than a standard MacBook Pro display. IPS technology gives a wide 178-degree view of everything on the screen, so you’ll see the difference at practically any angle. This is a game changer for anyone working with photography-editing programs, allowing pixel pinpoint accuracy when working with photos. It also features a new flash architecture. Flash delivers data up to 4 times faster and takes up just a fraction of the space of a traditional hard drive. The flash drive is permanently installed into the machine and has very little susceptibility to corruption or failure when compared to the standard drive. Apple also decided to go back to the NVIDIA graphics chip which by far outdoes the recent Intel graphics chip. Apple is sticking with the same Intel core 17 CPU processor which seems to be the industry standard at the moment. When inspecting the actual feel of this new machine, it is obvious that Mac has decided to steer clear of its previous firewire port design and in its place has added an extra thunderbolt port. It also has the standard dual USB 3.0 ports, and 1 HDMI port. The battery life remains about the same at 7 hours, but the actual machine is 25 % thinner that the older MacBook Pro. With a weight of just under 5lbs, it is clear this new machine was inspired by the design structure of the ever popular MacBook Air. This laptop is fitted with a new cooling system that drastically reduces the fan noise by reformatting the induction system as well as redesigning the shape of the blades on the fans themselves. While this does seem to be one of the greatest machines Apple has ever built. It does have its drawbacks. Unlike the previous model, the display is fused to the glass—meaning replacing the LCD requires buying an expensive display assembly. The RAM is now soldered to the logic board—making future memory upgrades impossible. And the battery is glued to the case—requiring customers to mail their laptop to Apple every so often for a $200 replacement. The design may well be comprised of “highly recyclable aluminum and glass”—but my friends in the electronics recycling industry tell me they have no way of recycling aluminum that has glass glued to it as Apple did with both this machine and the recent iPad. The design pattern has serious consequences not only for consumers and the environment, but also for the tech industry as a whole. It seems as though Apple has opted for a machine that is virtually un-repairable, un-upgradable and un-fixable all for the sake of reducing size and increasing portability. While this machine seems to be the very best for photographers and videographers alike, I have to wonder how soon the standard 8MB of Ram that the machine comes with will seem like nothing. I think this new piece of computer marvel is great for the average user, who wants something flashy, and portable, but leaves someone like myself, always avidly upgrading, a little disappointed in the versatility aspect. The price point on the new Pro starts at around $2,199, and is upgradable at the time of purchase. More information about the MacBook Pro 15” with retina display can be found here. What does dad really want for Father’s Day? Lots and lots of gadgets. Whether it’s a shiny new keyboard for typing faster on his iPad or a wireless speaker that fits in their pocket, it’s easy to find tech toys that will make them happy. Here are 8 great handpicked gifts from an article in Laptop Magazine by Dan Howley. So your dad needs a phone and you want to get him something that’s fast but also easy to use. Check out Nokia’s Lumia 900. For $99 you get the best Windows Phone on the market with 4G LTE speeds that will let him sneak sports scores anywhere with the exclusive ESPN app. And with its sleek, bright blue design and unique Metro-style UI, your old man will be the hippest guy in the office. Logitech’s Ultrathin Keyboard Cover is the perfect gift for the workaholic dad on the go. This lightweight but sturdy aluminum accessory won’t weigh him down, and the keys offer just the right amount of travel for comfy typing. He also gets dedicated shortcut keys for copy, paste and other commands, along with 6 months of battery life on a charge. Between work and family life, there isn’t much time for Dad to get in shape. But with the $99.95 FitBit Ultra Wireless Tracker, he can see how much his everyday activities are helping him stay healthy via a built-in pedometer. And the online diet goal and weight-loss planner can help him figure out if he should get that second round of hot wings. Dads need their rest, but they also need to get up and go. So get him the iLuv Vibro II, an iPhone alarm clock dock with a unique shaker alarm accessory that vibrates whenever the alarm goes off. If this thing doesn’t wake him up, nothing will. At just under $65, the iLuv also comes with an FM radio tuner and a free app that gives him access to more than 40,000 Internet radio stations, as well as weather forecasts. If your dad is an Apple fan and a camera fanatic, then the Olloclip for the iPhone 4S is just what he needs. For $69, dad can drastically improve the functionality of his iPhone’s camera by adding three types of lenses, including fisheye, macro and wide-angle. Each lens offers a different shooting experience so your dad will be able to capture all of those special family moments. For the dads who want to rock out while on the road there’s the $59.99 DBest London PS4001BT Solo Bluetooth Rechargeable Speaker. This pint-sized accessory pumps out loud, high quality audio that puts other portable speakers to shame. The Moshi iGlaze Versacover is an iPad cover like no other. With its fun origami-style design, you can fold and flip the Versacover to use it as both a vertical and horizontal stand. And thanks to its hard plastic rear cover, the Versacover offers more protection for your dad’s iPad than Apple’s Smart Cover. Does dad need to tune out the kids once in a while? The Plantronics BackBeat Go is just the ticket. These $99.99 Bluetooth headphones will let him listen to music, movies and make calls all without any wires connecting him to his Smartphone. And with the Plantronics MyHeadset app for Android and iOS devices, dad will always know how much peace and quiet he has left before the BackBeat’s batteries run out of juice. Hope this short list helps your dad get what he would like. Regardless of what you get him, if it’s from your heart, he will love it. The staff here is very polite, very helpful and the technicians did a fantastic job. I have already recommended Laptop Repair Denver to other friends! Danny T. - "Polite & Helpful"